MELBOURNE - The discussion on inertia and synchronous generation is rather confused. Inertia is necessary because it provides stability to the grid. “Strength” and “stiffness” are terms that are used to show that lots of rotating inertia is “good’ or even essential to a stable grid. Because it was free it is often assumed that the system needs as much generator inertia as it always had. But inertia is just one way to supply stability and it can be argued that beyond more than a certain minimum level, generator inertia is an expensive and anachronistic way of providing stability. Stability is required to protect timing circuits, minimise mechanical loads on motors and generators caused by changing speed, prevent overheating of inductive loads like AC motors and most of all to prevent voltage/frequency oscillations after fast changes in load or generation e.g. from a loss of a connection or generator or even start-up of all the hot water services at 10PM. Inertia is one simple way of providing stability because the rotating mass of the generators absorbs or disburses energy by small changes in speed. While the inertia of turbines is large, it is only useful as a store of energy if you can use it. Most of the energy stored in a rotating turbo-generator is unavailable because the energy is 1/2Jω2 where ω is the angular velocity and J the rotary inertia. As the angular velocity is only supposed to vary by 0.15Hz in 50Hz you can only use 0.6% (49.85/50)2 of the inertia in the system to stabilise the load. Even if a 1Hz short term deviation is allowed it is still only 4% of the system inertia. The key to stability is not so much the inertia itself but the synchronous nature of an AC system which locks all the turbines and loads together at the same frequency, thus inertia is not just that of one generator but all the synchronous generators, the capacitance of the transmission and distribution network and even all the AC motors and loads on the load side. These later contributors are still there, even if some of the generation is no longer synchronous. The downside of inertia is that once it is given up it must be replaced. So, if system frequency falls by 1Hz, to recover the frequency a large fraction of the output response from the remaining generators is used just to spin all the generators and loads back up to speed rather than just supply lost power to the grid. In the best case, it will prolong the frequency disturbance. In worst case the extended frequency deviation will trigger protection circuits and more widespread faults. In a conventional system inertia provides the first 0.1-10 seconds of load disturbance response and it was free. A steam plant is quite good for the next 3-6 seconds after a disturbance because there is a quantity of steam in the steam chest which can be released quickly. If the lost generation stays off line steam is then limited because it has slow ramping after that first steam dump. Hydro comes up after 20-150 seconds but has excellent stability and very fast ramps. The combination of inertia of water in the penstock and rotary inertia of the generator gives very stable ramping and for large scale power changes, hydro seems to offer the best combination of ramp rate and stability. Gas turbines respond quite well after 8-30 seconds, then ramp quickly if they don’t stall or oscillate which they are prone to do at low loads. It is clear that “the straw that broke the camel’s back” in the SA blackout was the failure of gas turbine generators at the Quarantine station to respond properly to rapidly increasing demand. However, even if inertia is seen as desirable at the plant level, gas turbine plants have no more inertia per MW than wind and many of them are operated slaved to the largest generator(s) because it is simpler and more efficient. 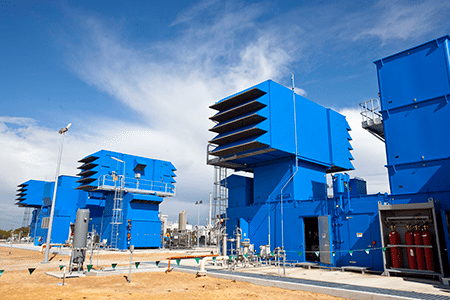 But if the key large generator(s) are for some reason isolated from the grid, the gas turbines will sag under the increased load and they will have limited mechanism or perhaps, if they are already at full load, even capacity, to respond. So, within fractions of a second their frequency will start to fall just as quickly as a group of wind turbines. Even if governor response is fast, maximum stable ramp rates are around 5-10% per minute usually starting at less than that (they tend to have S shaped response curves) Gas turbines have another weakness which means that their inertia is of less value to the grid. If frequency falls the compressors slow down reducing compression ratio and thus power so even more so more of the governor response is needed just to compensate for reduced air flow.